Summary (from Goodreads): A short, sleek novel of encounters set in the witching hours of Tokyo between midnight and dawn. At its center are two sisters: Eri, a fashion model sleeping her way into oblivion; and Mari, a young student soon led from solitary reading at an anonymous Denny’s into lives radically alien to her own: those of a jazz trombonist who claims they've met before; a burly female “love hotel” manager and her maid-staff; and a Chinese prostitute savagely brutalized by a businessman. These “night people” are haunted by secrets and needs that draw them together more powerfully than the differing circumstances that might keep them apart, and it soon becomes clear that Eri’s slumber–mysteriously tied to the businessman plagued by the mark of his crime – will either restore or annihilate her. After Dark moves from mesmerizing drama to metaphysical speculation, interweaving time and space as well as memory and perspective into a seamless exploration of human agency – the interplay between self-expression and understanding, between the power of observation and the scope of compassion and love. Murakami’s trademark humor, psychological insight, and grasp of spirit and morality are here distilled with an extraordinary, harmonious mastery. 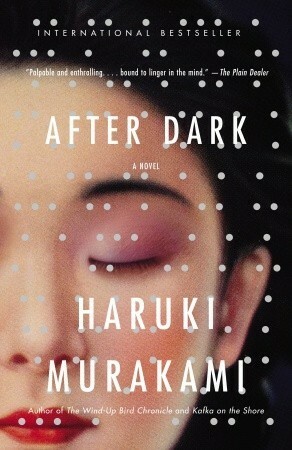 My Summary: Set over the course of a single night in a crowded city in modern-day Japan, After Dark explores the seemingly unrelated connections between the things that bring us together and the things that force us apart. My Thoughts: This was a quick read, but every bit as good as Murakami's other novels. The writing was brilliant and felt more like prose than the descriptive language it was. Every word felt like it had been thought out extensively, and in trademark Murakami style, each sentence made you stop and think. I loved the mystery element, and the phenomena of the "other side" was both creepy and intriguing. Final Thoughts: I recommend this novel to anyone who has enjoyed other books of Murakami's, as well as those who enjoy contemporary literature with a touch of fantasy.